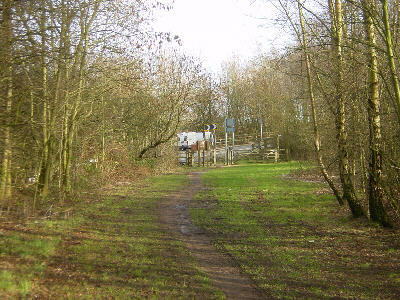 At Littlemoss the footpath that follows the canal line crossies a road leading to industrial premises at the site of a former swing bridge. 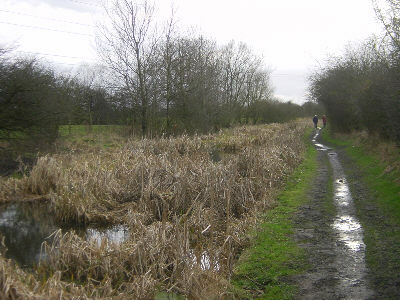 A short way ahead, the canal is partly in water, with the towpath running along the left side. 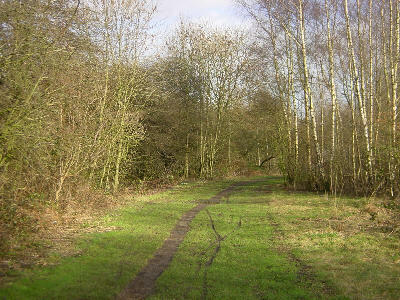 Looking north from the site of the former swing bridge. 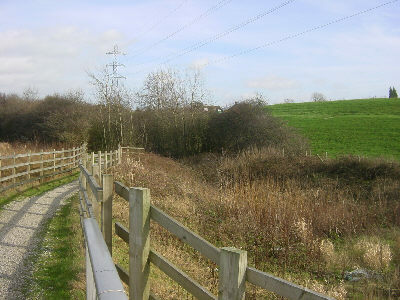 Looking back towards the site of the former swing bridge. 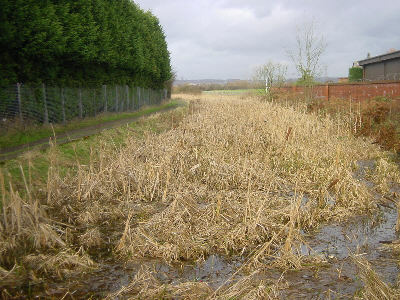 The canal is overgrown but in water. 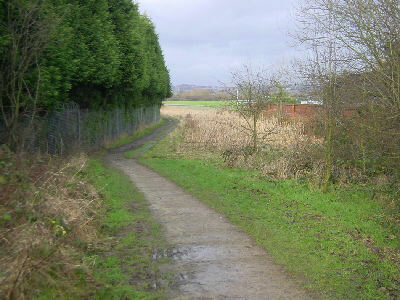 Looking north near the former Littlemoss School. Soon, Cinderland Bridge comes into view. Away to the right is Cinderland Hall, dating from the sixteenth century and originally timber framed, but now encased with brick. The stretch of before Cinderland Bridge had been used as a water supply for the now-demolished Lumb Mill. Because the ground had been severley affected by subsidence, the banks have had to be built up in concrete to keep the water in! As as result there is too little headroom under Cinderland Bridge and walkers must duck theor heads! Imediately north of the bridge is a dam and the canal returns to its sunken level. Looking north-east from Cinderland Bridge. Looking back to Cinderland Bridge. 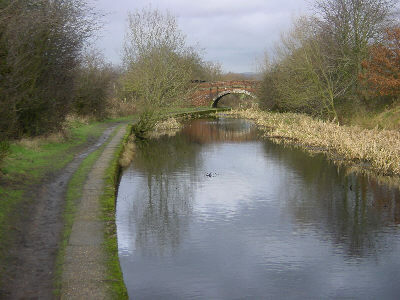 The canal begins to run along the edge of the valley of the River Medlock. 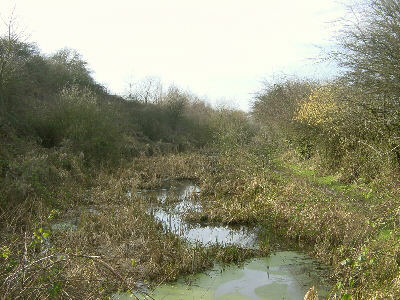 A continuing stretch of reeded-up canal typical of the Littlemoss area. 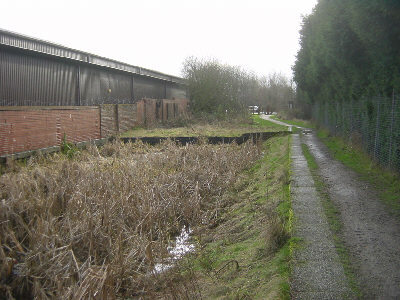 The canal near Littlemoss Camp. 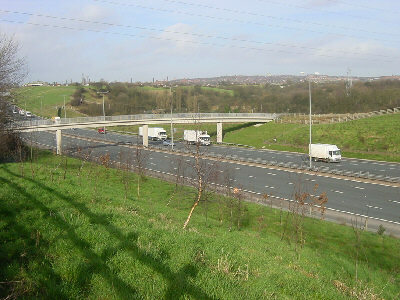 M60 Crossing near Littlemoss Camp. Suddenly, the canal ahead disappears as the M60 motorway cuts through. 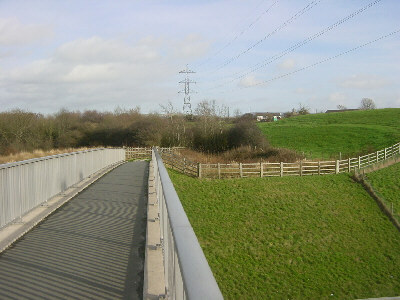 The towpath route has been diverted across a new footbridge. 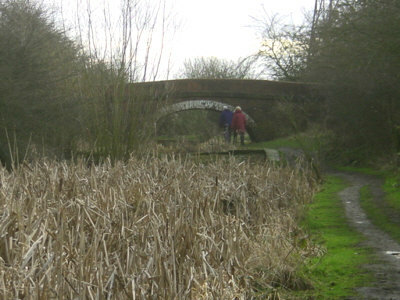 The motorway cutting is a difficulty for canal restoration, as it would appear that it is not deep enough at this point for a simple aqueduct to be built on the original line. 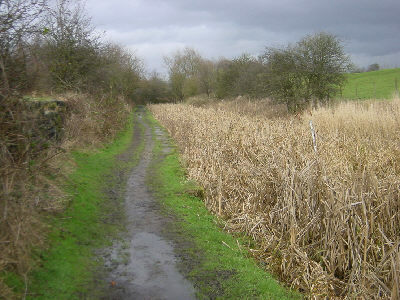 However, the land has sunk by around 1.5 metres at this point, due to mining subsidence, so the canal would need to be raised to keep at the same level as at Droylsden. 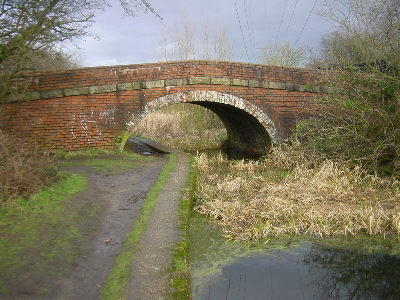 The combination of this extra height and a possible small detour to an aqueduct built slightly to the north-west of the original line, where the motorway has lost height, could give the canal enough clearance over the motorway. 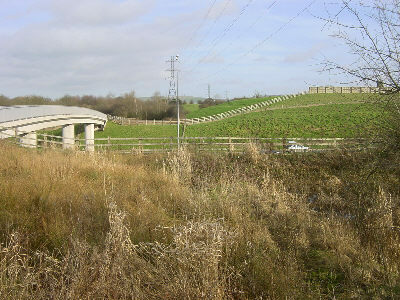 The footbridge across the motorway, Littlemoss Camp. 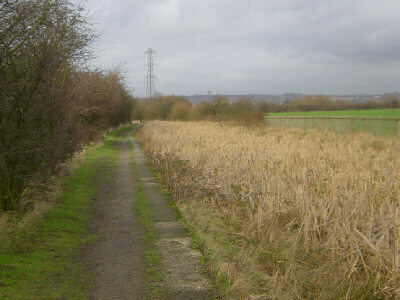 The canal line continues on the far side of the motorway. 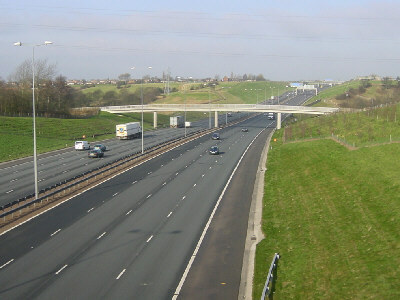 Looking back to the motorway footbridge. 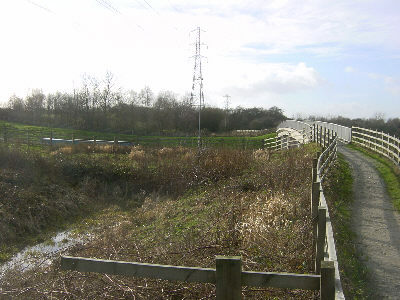 North-east of the motorway crossing, the canal bed has some reeded-up water in it. 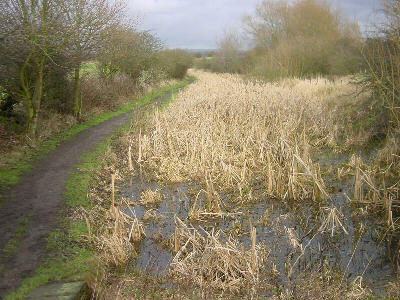 The canal has been infilled and grassed over. 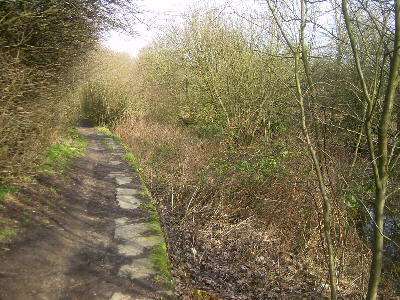 Trees growing onto the line of the canal, narrowing the route. Shortly, the canal reaches Stannybrook Road, where a steep-sided hump bridge has been removed. The road now crosses at around towpath level. 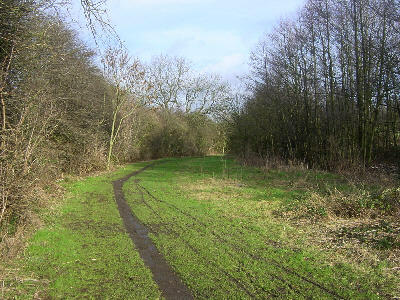 Cross the road carefully (the road bends) and continue straight ahead, where the canal line is now the entrance to the car park of Daisy Nook Country Park.